If you haven’t seen the ending of the original “Gatchaman” series, please stop reading now as it’s pretty much impossible to do a write up of this series without mentioning the original’s shock ending. Two years have passed since the Science Ninja Team defeated Galactor at the heavy cost of the apparent death of Joe. However Leader X returns to Earth, sinking a cruise liner named the Queen Margaret. Abducting a child who has been sucked underwater, Leader X hastens the child’s puberty and in a very short time transforms him into an adult mutant named Gel Sadra who has been conditioned to head up the new Galactor. At an emergency meeting at the International Science Organisation (ISO), mysterious disappearances of military personal and scientists are discussed. Dr Nambu announces that Galactor has returned is behind the disappearances and that despite their apparent disbandment, the Science Ninja Team has reformed and will do battle with them. At their new underwater mobile base, G-Town, the Science Ninja Team assemble to take on a new case. Nambu introduces Joe’s new replacement, Getz, however the rest of the team are less than impressed with his overly cocky attitude. Gatchaman and the team are sent out in the New God Phoniex to investigate newly discovered ruins of an ancient civilisation on Easton Island inside a cave system. But it is soon revealed that this is a trap set up by Galactor with Getz revealed as a Galactor agent who killed the real Getz and assumed his identity. After escaping and destroying one of Galactor’s mecha, the team set about silencing the faux Getz to avoid him telling Galactor about the location of G-Town. However Getz is found dead, killed by a feather shuriken, Joe's trademark weapon. A shadow on the wall of the cave seems to indicate that Joe is still alive. Outside, the team battle Galactor in their new mecha, however Ken’s jet is caught up in an explosion when he finishes off their base on the island. As he falls into unconsciousness, Ken believes he can hear Joe shouting at him to evacuate from the cockpit. Ken awakens to find himself inside a cave with the rest of the Science Ninja Team surrounding him. Former Galactor scientist, Dr Raphael, has apparently saved him and killed the Galactor agent posing as Getz. Raphael tells them of his defection from the organisation and how he now fights against Galactor. In a later case, Gatchaman is sent out to the country of Amelia to sabotage a Galactor base. However, Gatchaman and the Science Ninja Team find themselves overwhelmed by Galactor agents. Miraculously a man claiming to be Joe appears and helps them defeat the agents. Joe explains that he was saved from near death by Dr Raphael and has been recuperating since that time. Joe rejoins the Science Ninja Team, who are overjoyed at the fact he is still alive. However as the team take on various missions, they soon discover something isn’t right. Joe takes on impossible tasks with superhuman strength in which he should be severely injured or killed, yet seems to manage to survive them all without a scratch. Five months after the theatrical release of a compilation of episodes from the original TV series, this series debuted on Japanese TV in October 1978. It eventually became the basis for the 1996 English dub “Eagle Riders”. Two years prior in 1976, Tatsunoko had written treatment for a follow up series to the original “Gatchaman” where a dying Joe was saved by Leader X who then transforms him into a villain named Space Joker. Joe’s long lost brother, Jack, joins the Science Ninja Team as Joe's replacement, and of course end up fighting his brother. A second abandoned treatment is similar to the final broadcast series; an android duplicate of Joe is created by rouge scientist, and the android actually believes he is the real Joe. If it wasn’t already obvious (and most of the synopsis of the series on the web and in books already point this out), the Joe in the final broadcast version is mostly a cyborg created from Joe’s body by Dr Raphael. I really wished the original concept for the series was given the green light as this show the final broadcast version is a bit of a dud really. This is despite the fact most of the staff on the first series had returned. In addition Akemi Takada ("Creamy Mami", "Kimagure Orange Road", "Patlabor") updated the character designs (from the original 1972 Yoshitaka Amano designs) and created new ones, famed mecha designer, Kunio Okawara (who did the original Gundam designs) created the new mecha, and most intriguingly Mamoru Oshii, who was a staffer at Tatsunoko at that time, was episode director and storyboard artist for a handful of early episodes. Despite Okawara being board for the mechas design, many of the designs are pretty mediocre and uninteresting compared to the outlandish ones we got in the original series. The New God Phoenix receives a new robot pilot, Pima (obviously influenced by R2-D2), whose main function is to enable Ryu to join the rest of the team on missions. Other changes include less Galactor mecha which I think makes the series a lot less interesting. In this series Galactor seems to me more concerned with creating natural disasters, and the Science Ninja Team seem to be constantly infiltrating and destroying Galactor bases most of the time. The stories in this series (and the dialogue) are kind of rubbish to be honest. Sure, a lot of the plots in the original series where absurd and silly, however you couldn’t say that they weren’t fun. Tatsunoko put a lot of love, time and effort into the original series. It just looked brilliant, better than any other anime on TV at the time. With this series it seems minimal effort in just about all aspects of production was the order of the day. The animation in particular looks a bit shoddy and is in no way up to the standard of the original. Most annoyingly live action undersea footage is occasionally used for the ocean outside the windows in G-Town, which is not to scale with the animation in the foreground. The result looks as if they are in a part of the ocean where giant schools of fish roam. The music has also been changed with the fantastic original music by Bob Sakuma replaced with less exciting, and frankly inappropriate at times, score by Hiroshi Tsutsui. Apart from the R2-D2 rip off Pima robot, I noticed quite a number of sound effects ripped straight out of “Star Wars” including Tie fighter, light sabre and R2-D2 sounds. I even noticed the familiar whir of the TARDIS used as the sound one of Galactor’s mecha made. While Joe’s mysterious return is the main plot for a number of the initial episodes, the focus soon changes to Dr Pandora, a female specialist hired as an assistant by Dr Nambu. While the team are suspicious of her at first, she proves where her allegiances lie and ends up being an invaluable member of the team. She even ends infiltrating Galactor bases on her own a couple of times. In the last few episodes of series, Pandora and Gel Sadra become the focus of the story of the finale, which also includes a Galactor plot to change the course of the sun thereby destroying Earth and the solar system. A secondary plot has Joe given a special mission by Dr Raphael in order to kill Leader X. Unfortunately the vast majority of the other episodes are just padding. Most are daft wastes of time such as an episode where Dr Pandora creates a device so children can communicate with animals only for Galactor to plant bombs in an attempt to kill them. Galactor, the ISO and the Science Ninja Team come off as incompetent a lot of the time when compared to the original series. Members of the Science Ninja Team seem to be captured by Galactor quite often, their machines totaled (with an almost a never ending set of replacement machines) and surprisingly there are a number of failed missions. Their personal weapons have been changed too, with Ryu’s being a weird green slime thing called Gripper. Luckily most of these rather daft weapons are used sparingly. Sentai’s 9 disc set isn’t all that brilliant. The source is quite a cruddy looking old composite analogue master with a lot of aliasing and interlacing and blatant film splicing marks. It looks pretty horrible. For some unknown reason, the opening and closing animation only contains romanised lyrics to the songs. There’s no actual translation of the lyrics. Overall, this is not a great series. Most of the episodes are pretty crappy to be totally honest. The writing is pretty bad and the mecha (when it appears) is pretty mediocre. With the final few episodes things do improve dramatically. However a lot of time has been wasted getting to these episodes for no real reason or benefit to the story. 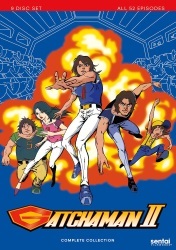 Looking at this series and the original, it’s as if the staff behind “Gatchaman II” didn’t really see the previous series and only read a few of the old scripts to get up to speed. Not only do Galactor's mechanised monster robots which were a key to original's success rarely appear, but also the commanders under Gel Sadra make fleeting appearances or don’t exist at all. Compare with the original series. The final few episodes are quite good, but don’t make up for all the rubbish which preceded them. 5 out of 10. Remaining Backlog: 14 TV series, 5 OVAs and 10 movies. In addition I am also waiting for additional parts of four TV series to be released before viewing them.